This is a lovely big beachside holiday home that backs onto the dune reserve at Marcoola Beach; offering family friendly accommodation for up to 12 guests. 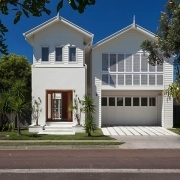 The two storey 5 bedrooms, 3 bathroom home with ducted air conditioning, sparkling in ground pool and is conveniently located to local cafes and the beach is only metres away. There are big sunny decks and shutters on the verandah to filter the sun and manage the ocean breeze. The family friendly home has 2 levels with lovely timber floors throughout the lower living areas which includes the long entry hall, lounge room, dining room and modern kitchen. On this level there is also the laundry, powder room and double garage. Off the living room is a covered outdoor entertaining area with casual dining setting & BBQ. The north facing patio overlooking the garden with a Bali inspired water feature is a sunny place to hang out with a book. The fully fenced yard is great for the kids to play on the grass and there is a lovely big swimming pool. Upstairs there are 5 bedrooms; the large master bedroom has an ensuite with a spa bath and its own with private deck. There are three other rooms with queen beds and a family bedroom that sleeps four. The main bathroom has a bath and shower and separate toilet and a 3rd smaller bathroom with a shower and separate toilet off the family bedroom. The casual lounge room with 55″ smart TV and DVD player is also located on the upper level. Master bedroom has a queen bed with large ensuite and spa bath, the private deck overlooks the dune reserve. The upstairs outdoor lounge area is off this room as is the access to the viewing deck. Stunning galley style kitchen with white stone top breakfast bar with its open plan design next to the dining, living rooms and overlooks the garden and sparkling pool. There are Quality European appliances, dishwasher and two door fridge/freezer. Generous open plan living spaces on the ground floor that flow onto the lovely outdoor entertaining area and pool make this the ideal family friendly holiday home. Glass bi-folds doors, louvers & doors to the north take full advantage of the cross ventilation keeping the house nice and cool. The house is located in a quiet residential street backing onto the dune fauna reserve and the beach is a short 250m walk to the beach. Marcoola Beach is fast becoming one of the Sunshine Coast’s most popular destinations. Its proximity to Coolum Beach, Noosa Heads and Sunshine Coast Airport is not it’s only attraction. Within 20 minutes you can be in the Hinterland exploring Maleny, Montville and surrounding areas. For those that like to enjoy an early morning challenge or beautiful sunset, Mt Coolum is 2 kilometres away. The white sandy surf beaches are uncrowded and offer great surf for boardriders of all levels. It’s popular for families, fishing and is pet friendly. The house is located 500m from Marcoola patrolled beach and surf club. For golf enthusiasts, the popular Twin Waters and Mt Coolum Golf clubs are a short drive from the house so pack the clubs. There are several local cafes within easy walking distance from the house and a short drive to the local shopping centre at Mount Coolum or Coolum Beach is 10 mins away.